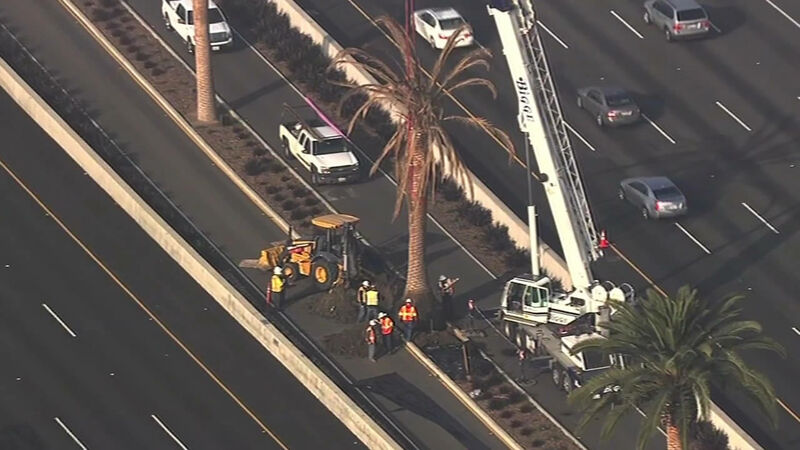 SAN FRANCISCO (KGO) -- At least $10,000 worth of palm trees along the new eastern span of the Bay Bridge are being replaced a year after they were planted because they are dying. Landscape architect Clive Endress says he was asked, "'Well, why didn't you plant oak trees? This is Oakland. I grew up in Oakland.' Well, oak trees will not live here, they will die here." He is standing by his vision of the 37 Canary Island Date Palms that were planted along the Bay Bridge. Endress explained, "It's a project of a lifetime. I mean, you want to get it right." Caltrans paid people approximately $1,000 for each tree. Endress said people were told, "'It's going to be a star, we're going to make your tree a star.'" Two palms previously tested positive for pink rot, but irrigation modifications are helping. Now, five more trees are dying. Endress agreed, "Certainly, it begs the question 'What's going on here?'" Caltrans has replaced three trees on Thursday and are expected to replace two more over the next two weeks. Endress says CalTrans expected 10-15 percent of the 37 trees would not thrive because of their age coupled with re-planting. Bay Bridge spokesperson Leah Robinson-Leach says, "Now, it may be unusual to someone who does not know or who may be driving past, so this is our opportunity to help them understand." It will cost approximately $13,000 to purchase, transplant and maintain each tree for three years. However, Caltrans says tree replacement is in the budget. "We just need to get them established. Remember, we've only had them in about a year now," Endress said. Endress says like any Bay Area transplant, some need longer to adjust, while other's won't make it.